Today Ainslie Paton is here to tell us about writing 70s fiction. Her incredible novel Hooked on a Feeling blew me away in all its 70s glory. You can read my review here. But long story short, you really need to read this book and get yourself some 70s action! Writing a nostalgia story is what you do when you’re too darn cluckin’ chicken to write an all the way genuine historical romance. That would be me – cluck, cluck, cluck. I love the idea of writing an historical novel that’s anatomically, socially, structurally and politically correct. Chances of that happening this side of a zombie apocalypse? Not finger licking good. But nostalgia though, nostalgia, the stuff of near history, of yeah I vaguely remember that, and I still have the t-shirt, can sing the words, know the dance moves - that was an attractive proposition. I could cheat. Clever chook. Then I started writing, and I realised how much I couldn’t, didn’t know and how much Lady Google and I needed to hang out. Did they have TimTams in 1975, what did people eat, what movies were showing, what songs were playing, what events took place that I needed to be aware of in the broader social context of my story? But the fun stuff, the cars and clothes and facial hair, the language and the influences. It was intoxicating. It was Etch-a-sketch instead of tablets, phone boxes instead of mobiles, (which were things you hung over a baby’s crib), colour TV instead of pay-per-view. 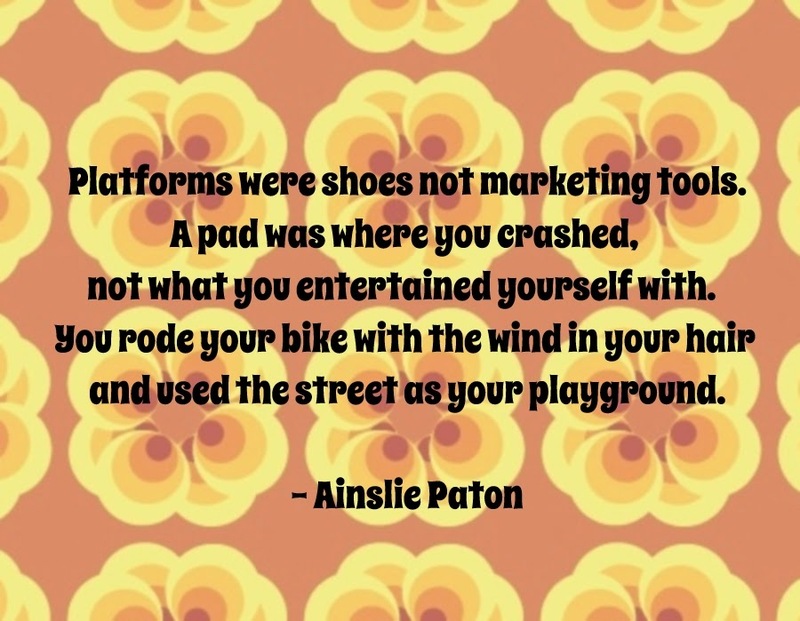 Platforms were shoes not marketing tools. A pad was where you crashed, not what you entertained yourself with. You rode your bike with the wind in your hair and used the street as your playground. Swearing was risqué, smoking was cool, drink driving wasn’t yet illegal, the shops closed at weekends, and very little was open at night. By today’s standards it’s a wonder childhood fatalities weren’t sky-high. “Mum, watch this.” Dean had something in his hand, a piece of plastic. He spread it over his wide-open mouth like a mask. It was Glad Wrap. Good God. He sucked the cling-film back into his mouth, until his lips distorted and went white, until the plastic made a loud pop. Beside him Kim did the same thing. “We’re popping cherries. Kim showed me.” He sucked in another piece and it popped hard. And Kim did too. “It’s only Glad Wrap. Joyce said we could have it,” said Kim. Gayle looked around and yes, the other kids were doing it too. Couldn’t the parents see that it was a really silly thing to let them do? But I had issues too. How did people talk? If I used phrases from the 70s would the story simply seem silly, a groovy baby parody like Austen Powers, instead of a realistic setting? Same concern with the fashions. How many flares and open necked shirts, ponchos and cheesecloth can one story take? How many moustaches until you’re having bad Tom Selleck dreams. I wasn’t writing comedy by design, but I didn’t want it to be accidental either. Gayle stood with Hazel in the big backyard of her family’s house. She’d brought a large bowl of rice salad and she hoped it was appropriate. Of course Hazel had said come as you are, no need to bring anything. There must have been twenty or more adults and almost as many kids of various ages in the yard. Gayle was glad she’d worn a sundress. It was orange and white and looked cool and chic even if she felt hot and awkward, and so nervous. Really, what was there to be nervous about, these were just the neighbours. She was suddenly incredibly thirsty and wondering how long she needed to stay to be polite. The other women wore dresses as well, though one woman had culottes on and Hazel wore a navy and white shorts jumpsuit that laced up the front and had zippered pockets. The men were mostly in stubbies and t-shirts, though Mr Stone—Barry—wore a Hawaiian shirt. Was my chook plucked, my goose cooked? Here’s the thing. I can’t answer that. I did my best to marry near history and its issues and sensibilities with today’s interests. Because what I really wanted to do was write a romance in the context of what’s changed and what hasn’t. We parent kids differently, though thankfully, the stigma of single-parenthood has fallen away. We get arrested if we drink and drive and we can shop twenty-four hours. But we still bring shell-shocked soldiers home from wars, women still suffer from post natal depression in silence, we still don’t have equality in the workplace, or equal pay for women, and families still break apart through infidelity. Everything old is still with us one way or another. She scanned the story and a paragraph jumped out at her. Well yeah. What would be the point in doing the same job for less pay? Hooked on a Feeling and its spin-off free short Sixteen Reasons (via Smashwords) are set in 1975. They’re nostalgia stories with modern bite. She's written about everything from the African refugee crisis and Toxic Shock Syndrome, to high-speed data networks and hamburgers. You can also find the companion story, Sixteen Reasons, for free on Smashwords. And you can find our review of Hooked on a Feeling right here!